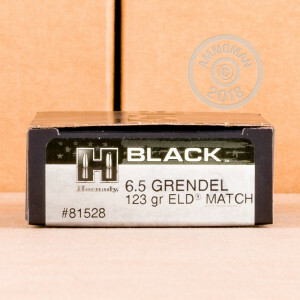 This 6.5mm Grendel cartridge by Hornady features a 123 grain ELD (Extremely Low Drag) Match projectile. 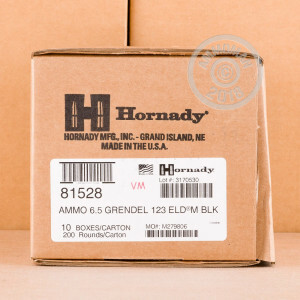 The ELD Match sports Hornady’s own Heat Shield tip, which is so resistant to the effects of aerodynamic heating that it’s virtually incapable of deformation in flight. This bullet’s tip also initiates violent expansion when it gets driven down deep into its core upon impact. This bullet’s stellar accuracy is further reinforced by its streamlined secant ogive profile as well as its boat tail design which markedly improves its ballistic coefficient. The culmination of its bullet’s features means this is a round you can use to truly gauge just how precise your shots can be. 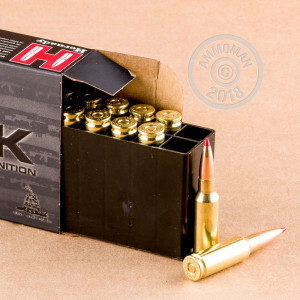 Hornady’s BLACK line of ammunition offers versatility and excellent performance. As such this round also features a select brass casing which you can reload multiple times, a sensitive and non-corrosive Boxer primer, and an optimal propellant load to ensure consistent chamber pressures with every shot. The Nebraskan company has for seven decades now set new standards for what we ought to expect from our country’s manufacturers’ best efforts.